Precious spices like nutmeg and cloves were immensely valuable commodities in the seventeenth century. Prized for their medicinal properties as well as their capacity to flavor food, they could be sold for an enormous markup in Europe. The problem was that they were only available on a set of remote islands in Southeast Asia. The bulk of the world’s cloves came from the island of Ambon or Amboyna and its surrounding territories while the Banda islands was the world’s richest producer of nutmeg. Gaining control of these islands and the commodities they produced represented a huge logistical and political challenge for Europeans and it dominated the early years of company operations. Three spices, nutmeg, mace and clove, dominated the European imagination and drove a sustained pursuit that saw European ships traverse thousands of miles. 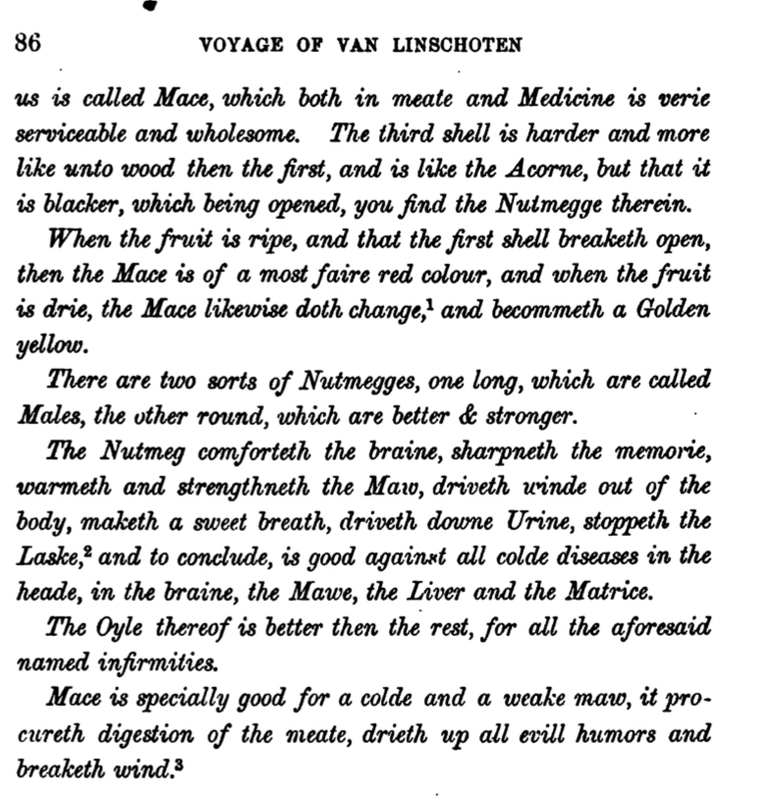 Here we have a description of the wondrous properties of nutmeg, which could cure all manner of diseases and ailments. The Nutmeg comferteth the braine, sharpeth the memorie, warmeth and strengthneth the Maw, driveth winde out of the body, maketh a sweet breath, driveth down Urine, stoppeth the Laske (diarrhoea), and to conclude, is good against all colde diseases in the heade, in the braine, the Mawe, the Liver and the Matrice. The Oyle thereof is better than the rest, for all the aforesaid infirmities. Mace is specially good for a colde and a weake maw, it procureth digestion of the meate, drieth up all evill humors and breaketh wind.